Her tactic in the Agapia address was one she borrowed from the famous Orthodox theologian Paul Evdokimov. There is, Behr-Sigel posited, a unique feminine charism or gifting that grounds whatever ministries women enjoy in the church (and there are many such, she thought—individual Orthodox women have been "confessors, martyrs, apostles, evangelists, prophets, and saints, married and celibate women alike"). Biological femininity is a sign of a particular "spiritual organ of human nature" that "might be defined as the capacity to receive divine grace." Put crudely, if "men are from Mars and women are from Venus," the argument would then be that the Church needs not only Martian but also uniquely Venusian gifts. 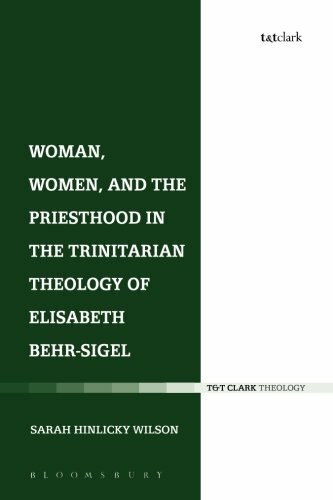 Although in this speech Behr-Sigel celebrated the gradual historical unfolding of the significance of Paul's words in Galatians 3:28 ("in Christ Jesus … there is no male and female"), she stopped short of endorsing the ordination of women to the priesthood. This is because "the priest represents Christ; he is the sacramental presentation of Christ, the Word incarnate who assumed full humanity in the masculine mode of being." Given Christ's male humanity, Christ's representative at the Eucharistic altar should also be male. Yet, in that lecture, Behr-Sigel had sown a seed that would later come to trouble her. Alongside her use of Evdokimov's theology of a feminine charism, she had also made the apparently contradictory claim that Scripture contains no "theoretical exposition on the nature of women and their specific charisms." This insight—that Scripture's language of spiritual gifts and graces doesn't map cleanly onto the male-female binary—would come to loom large in Behr-Sigel's later writings on the role of women in the life of the Church. In a lecture given eight years after her Agapia address, for instance, she came clean on the limitations of her earlier approach: "[T]he use of the idea of [feminine charisms] runs the risk of being a mystification … . There is no mention in Paul's letter [to the Ephesians] of feminine charisms which would be different from those given to men." (She might have emphasized more than she did the exegetical point that wifely "submission" in Ephesians 5:22 is equally enjoined upon men in 5:21, while husbandly "love" is also expected of women in 5:2—in short, there is no special vocation of men envisioned in the epistle to the Ephesians that women don't share in, and vice versa.) What Behr-Sigel now wanted was an account of how God's call came to women, not a pre-formed understanding of "femininity" that could be used to evaluate that call in advance. She eventually discovered such an account right in the heart of the most basic Christian—and Orthodox—doctrine, the teaching on the Holy Trinity. According to Eastern Trinitarian theology, God is only knowable in the concrete hypostases ("persons," in English) of Father, Son, and Spirit. Any access to God's ousia—the divine being—lies in our knowledge of and communion with the persons. God's whatness, the divine substance or essence, doesn't lurk somewhere behind the persons, awaiting some gnostic discoverer to locate it and access its murky depths. Or, to shift the angle, we might say that God is not enclosed in God's nature; the divine essence is not a constraining prison. It is, instead, what we must speak of when we wish to speak of the oneness of the free, transcendent divine persons of Father, Son, and Spirit. For Behr-Sigel, it is likewise with human persons: even if gender were viewed as somehow a part of a person's "essence" or "nature," it is the property of human persons, bearing the image of their triune God, to transcend their nature. This was the mature insight Behr-Sigel eventually arrived at, and Hinlicky Wilson summarizes it well: "Any attempt to invoke the 'feminine' (or the 'masculine') always ends up reducing women (and men) to mere instances of their natures, rather than self-transcending persons in God's own image." In short, women are persons before they are feminine. Or, better: women's femininity is only knowable or accessible insofar as particular women—Elisabeth, say, or Martha—transcend it by living out the particular life God has given them.